The Meze 99 Classics uses a 40mm dynamic driver at the heart of its closed earcup design. With a 103dB sensitivity and 32ohm impedance, the 99 Classics can easily be driven by a smartphone’s built-in headphone amplifier. 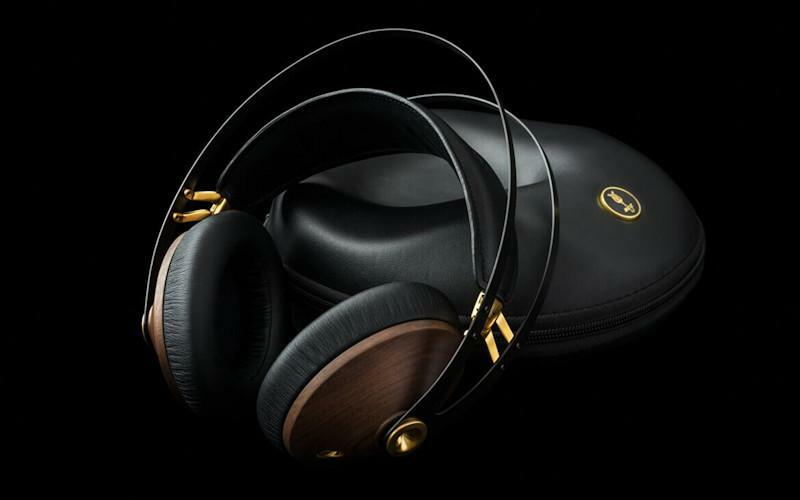 Unlike many headphones that use carbonized plastic or cast aluminum for their enclosures, the 99 Classic employs genuine walnut, and according to Meze, “The process of shaping just a single pair of earcups takes up to eight hours. The whole process of sanding, lacquering, and finishing lasts 45 days.” But even with all this genuine wood, the 99 Classics only weigh 260 g.
The headphone has several other unusual, if not unique, design details. The first one of note is its headband. Instead of click-stop headband with size adjustments, the 99 Classics’ headband utilizes a stamped manganese spring tension arrangement that’s designed so that it will fit a wide variety of head sizes without any adjustments needed and without major changes in apparent side-pressure. The suspended leather headband that sits below the sprung metal frame is also spring-loaded and wide enough to distribute the headphone’s weight evenly across your cranium. The Classic 99’s second distinctive feature revolves around its rubber “gimbal,” which allows for flexible movements in a 360-degree vertical plane to optimize the angle of the fit. When you combine the headband and gimbal with the 99 Classics’ medium density memory foam earpads, the results for me were an extremely comfortable and well-sealed around-the-ear fit. If my ears were a trifle larger, the 99 Classics would have been more of an on-ear than over-ear fit. So, if you have larger-sized ears, coupled with glasses, the fit could be less than ideal. If you like flash and glitz, I would recommend the Walnut Gold over the Walnut Silver. Neither color approaches the bejeweled excess of the Focal Utopia Tournaire ($120,000US), but they have more presence than any of the current crop of matte-black carbonized plastic headphones that are all too common these days. The only non-metal part of the earphones (besides the dynamic driver diaphragm, headband, earpads, and wiring) is the rubber gimbal, which is virtually the only part that could possibly, with ample time and an extremely hostile environment, show wear. That’s the only potentially weak link in what is an otherwise extremely robust headphone design. The 99 Classics have a removable cable connection and comes with two cables: a 1.2m cable with mic and remote and a longer, plain, 3m cable. 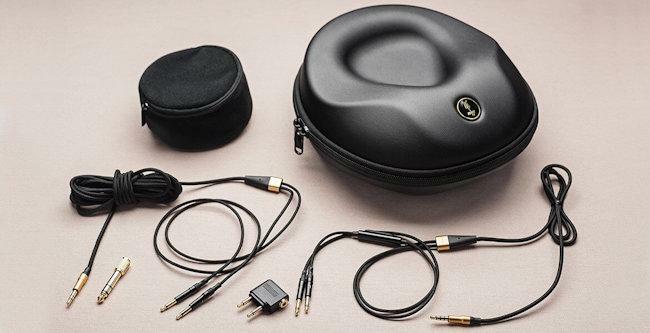 Other included accessories include a nice, hard EVA carrying pouch, 6.3mm gold-plated adapter, and a cable pouch. The cable connection on the headphone end is a stereo mini-plug recessed into the walnut enclosures. While you can certainly use third-party premium cables with the 99 Classics, careful attention needs to be paid to the size of the cables’ connector barrels, as many may not fit into the narrow diameter opening. One complaint about the supplied cable: although it is marked R and L, the markings are in white ink on silver, which is difficult to read in anything but bright light. Too bad the R side wasn’t printed in red. Isolation through the 99 Classics is fair, and better at reducing bass than treble, but not much more than around 15dB. So, you will hear some outside noise when the volume isn’t set for rocking out. But if you are in quiet environment, as long as folks are at least a couple of feet away, the closed can design will prevent them from hearing your music. While I can’t recommend the Classic 99 for bikers or runners who need some degree of continuous environmental awareness, the 99 Classics will work nicely in your local public library. I mentioned fit earlier in the review. I found the 99 Classics to be among the more comfortable full-sized over-ear headphones I’ve experienced. But if my 7⅛-sized head and regular-sized (I think) ears were much larger I might not have enjoyed the feel of the headphones as much. While the spring tension on the headband remains even during the first part of its expansion, the tension does increase as the spring becomes wider, so if you have a big head you will notice increased pressure, and the 99 Classics could be less to your liking. One last thing about the metal headband: if you tap it lightly, it will ring. If you rub it, you will notice the entire headband is microphonic. A rubber band damped the ringing in my review pair nicely, however. I used the 99 Classics with a wide variety of headphone amps, including the IFI xDSD, Bravo Audi, Sony TA-ZH1ES, iPhone SE, Astell & Kern Kann, and Mytek Liberty. The biggest bang-for-the-buck combo was the IFI xDSD ($399) routed into the Bravo Audi ($65). The soundstage was larger than with the IFI alone, but it wasn’t stretched–merely more expansive with the same level of image specificity. Tonally, the 99 Classics have a balanced yet relaxed sonic signature. While not as open in the midrange as the HiFiMan HE-V1000 V2, the Classic 99s don’t sound closed-in. They also have a more forgiving presentation of overly raucous material than the AKG K-7xx. The upper midrange, around 3K, wasn’t nearly as irritating as through the AKGs. Bass through the 99 Classics has both impact and nuance. Especially when there was separate upper bass and sub-bass lines, the headphones kept both separate and intact. I was impressed by both the character and control in the bass registers, as well as the lack of smearing from the upper low end. The 99 Classics’ treble presentation was smooth and unpeaky, while still retaining life and sparkle. Since my hearing only goes to 13kHz, I can’t say if there are any treble anomalies above this range, but up to that point the high end had the sufficient detail and life to keep music the flowing. • The 99 Classics are efficient and easy to drive. • The fit is very comfortable for small and medium heads. • The headphones have a warm, relaxed, natural sound. • The fit on the 99 Classics may be less than ideal for large heads and ears. • R and L Markings on the supplied cables could be more readable. • I wasn’t thrilled with the microphonic headband. For comparison, I chose the well-known audiophile standard, the Sennheiser HD 600 headphones ($399 MSRP, $299 street). The first major difference is the Sennheiser HD 600 are an open enclosure, so they do not have the same level of isolation as the 99 Classics. For bikers and runners, the HD 600 will supply more locational awareness, but won’t work as well at the library. Comfort-wise, the HD 600 accommodate larger ears, and its felt-covered earpads don’t get sticky in hot and humid situations, as do the 99 Classics’ leather pads. The HD 600’s headband is narrower, with only little squares of foam to cushion it, so in terms of long-term comfort I preferred the Meze. Sonically the 99 Classics present a warmer, less dry presentation, with more mid-bass, but less air than the HD 600. The 99 Classics also have greater bass extension, which was most noticeable on techno and modern pop tracks. On average-sounding, tracks I preferred the 99 Classics’ ability to minimize the upper midrange coarseness, but on better recordings I preferred the HD 600’s increased energy in the upper midrange. Some products get a lot of pre-production buzz and remain in high demand by reviewers and cognoscenti during their entire product life. The Focal Utopia and Sennheiser HD-600 would be cases in point. The Meze 99 Classics headphones may not have had this level of anticipation or hype, but they prove to be not merely good, but worthy of comparison with better-known and similarly-priced headphones such as the Sennheiser HD 600. If you are looking for a closed-back, stylish, comfortable (as long as your ears and head aren’t too large) headphone, with a natural, slightly warm tonal balance and good bass extension, you need to check out the Meze 99 Classics.